If you’re considering upgrading your Jeep’s tires there are several sizes to choose from and important factors to consider. Common tire upgrades can start at an entry level 33-inch, to a more common 35-inch tire size. Larger tires not only look good, but also allow you to roll over obstacles easier and have a larger footprint for better traction when aired down. In addition, unlike a lift, which gives you increased clearance for your skid plates and frame; larger tires will provide more clearance for the axles and differentials. Starting with the factory tires, which are typically 31 to 32-inches x 10-inches of width and comes paired to an 18-inch wheel. The narrow tire and large factory wheels tend to have more backspacing than an aftermarket wheel, which brings them in close to the frame. The tires themselves are considered all terrain and offer low noise and great wear. In addition, the 18-inch wheel results in less of a tire sidewall, which results in better handling while on the road. Upgrading to a 33-inch tire size, the Nitto Terra Grappler G2 is still an all terrain tire, but with a slightly more aggressive tread pattern. Since this is a slightly larger tire size, you should re-calibrate your Jeep’s drivetrain to correct the shift points and speedometer, this is true for any tire size upgrade you’re looking to do. This tire can be paired to an aftermarket wheel such as the 17×9 Mammoth Type 88. The 12.5-inch tire on a 17-inch wheel results in less sidewall and a bigger footprint when aired down. Often this tire and wheel combination should be installed on a Jeep with a leveling kit, but a 2.5-inch lift like the Teraflex lift kit with shocks provides better clearance while on the trail. Moving on to the 35-inch size, a good tire to try is the 35×12.5 Mickey Thompson Baja MTZ tire paired to 17×9 Mammoth Boulder Beadlock Style black wheels. The Mickey Thompson tires have a knobbier tread that will wear down faster than an all terrain and also give you a bit more road noise, but will give you great traction while on the trail. A 35-inch tire is larger and heavier, often requiring you to re-gear your Jeep, which is an added expense. Ideally the combination should be mounted on a Jeep with a 2.5-inch to 3.5-inch lift like the 3.5-inch Rock Krawler X-Factor lift. Finally, if you need to run a slightly larger tire, then the next size up would be a 37-inch tire, which is the largest tire size you can run on your Jeep without the need of cutting into the body of the Jeep. Nitto also makes a tire at this size, which is the 37×12.5-inch Trail Grappler and can be paired to a 17×9 Mammoth D Widow black steel wheel. Similar to the 35-inch tire combination, this tire is very heavy and will require re-gearing. This combination should be mounted on a Jeep with a 3.5-inch to 4+-inch lift. The same 3.5-inch Rock Krawler X-Factor lift from the 35-inch example can be used, but would also need 1.25-inch body lift in order to provide the best amount of clearance while on the trail. 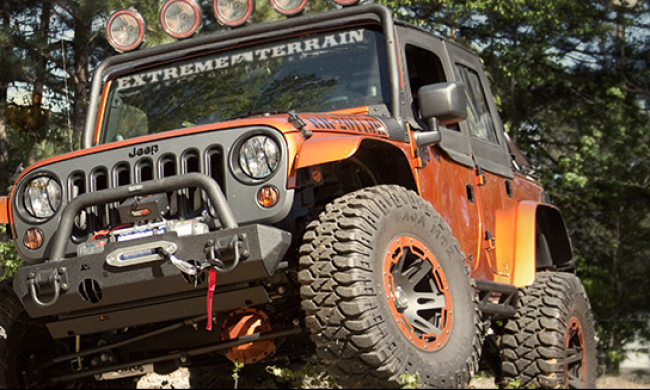 What tire setup are your running on your Wrangler or what are you hoping to upgrade to? Comment your setups and build aspirations below!